One of the simplest and the oldest gas de-dusting methods is gravitational separation of dusts from a gas stream. Devices using simple physical rules (rapid change of flow direction, centrifugal power, spiral traffic etc.) in the gas de-dusting process are called mechanical units. Mechanical dust extracting units are widely applied in the industry because of simple and compact structure, no moving parts as well as capability to operate in high temperatures and under high pressures. They are widely applied as a preliminary de-dusting stage system in installations which need to satisfy restrictive emission rates. They ensure separation of thick, erosional fractions of dusts. All of these devices can be applied for both, cold gases and fumes characterized by higher temperature. Thanks to developed solutions we ensure their proper operation even up to 600° C.
Capital expenditures for this group of devices are small; since their service is simple they are a great option for clients. Support in the area of selection - we always provide help in the field of selection of the most appropriate dust extracting unit. 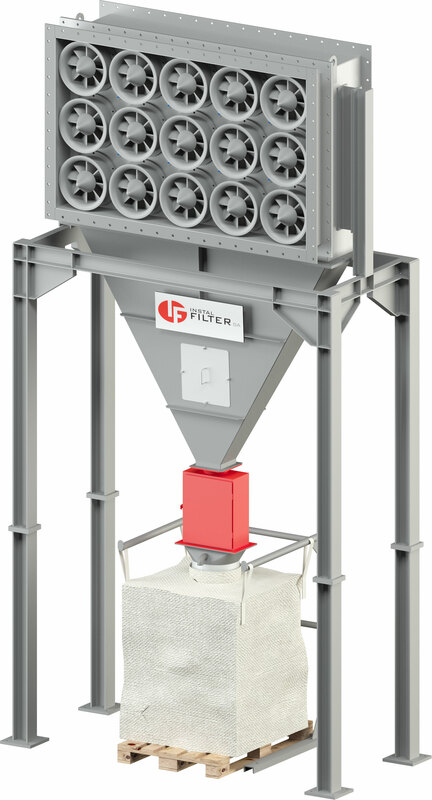 Not always the most efficient preliminary dust collector is also the most advantageous in the field of second level filtration. In CE/S cyclones the entire stream of dusted gas, after entering the dust extracting unit, is distributed to individual cyclones. Normally, a single set may comprise 1 to 8 cyclones. In case of requirement for a higher flow, there are erected sets comprising 10 or 12 cyclones. Long-term operational experiences regarding the cyclones in question enabled us to implement a lot of improvements into their structure. Bottom cone part of the dust extracting unit and outlet pipe have been modified. It enabled higher efficiency of operation, lower flow resistance and increase in resistance to erosional impact of dust. As a standard, CE/S cyclones are equipped with inspection manholes in order to enable inspection of interiors of the units. Depending on particular applications, outlet pipes can be erected in three size versions (0,4, 0,5 or 0,6) and the de-dusting part in two versions (3,5 or 4,5). Series of types of cyclones CE/S includes erection in size from 1x400 to 8x1000, and capacity range from 1000 to 100 000 m3/h. Types and thicknesses of materials are adjusted individually to a particular application (steel sheet, casual or characterized by higher resistance to abrasion). In case of these structures, the entire stream of dirty gas is de-dusted in a single cyclone. If necessary, in order to increase in efficiency one may configure them into more advanced systems. Standard series of types comprises erection of size Φ560 to Φ3150 mm, and efficiency range 2000 to 116 000 m3/h. CP horizontal cyclones are single units but flow of direction is reversed compared to the CO traditional dust extracting unit. In order to make gas traffic spiral, there are applied special blades. Such a solution is implemented in locations where space is limited and where typical configuration of connection cannot be applied. Standard series of types comprises erection of cyclones of size Φ500 to Φ2800 mm, efficiency range 9000 to 330 000 m3/h. MOS multi-cyclones are a sort of serial dust extracting units. The comprise many little de-dusting cells fastened horizontally in a housing of a dust extracting unit. These so called "vibration generators" are made of a cast-iron. Since we apply series of small cells to erect a dust extracting unit, we increase in efficiency of the de-dusting process (it grows up as the diameter of the dust extracting unit goes down). Proper number and configuration of cells ensures stable operation of the installation and, at the same time, high efficiency of preliminary de-dusting process. What is important, the MOS dust extracting units are of small dimensions (e.g. compared to cyclones) and they increase in dimensions of an entire system slightly. Standard series of types of MOS multi-cyclones comprises their sizes starting from 1 cell up to 40 cells, efficiency range from 3000 to 120 000 m3/h. During de-dusting process, in OK cell devices there is applied a rule of rapid change of gas flow direction. In a chute there is fastened an additional shield which eliminates effect of suction of dusts from the chute. Location of the shield can be regulated depending on required efficiency of the dust extracting unit. Chamber dust extracting unit can be applied as a first de-dusting stage, before such units as bag filters or cyclo-filters. They are used since in extracted air there may exist thick and abrasive dusts and consequently, there exists a risk of over-consumption of the filtrating material in a main de-dusting unit. OK type de-dusting units, by precipitation of thick fractions of particles, decrease in filtrating material loading rate. This process has a positive impact on service life of the material. Chamber OK dust extracting units may also play a role of separators of particles in case of a process which re-uses the thicker fractions. Such cases occur in progress of, among others, production processes (blasting lines, bituminous compound etc.). Simple structure of chamber dust extracting units makes that their connection sizes are comparable to sizes of connection ducts supplying dirty utilities. 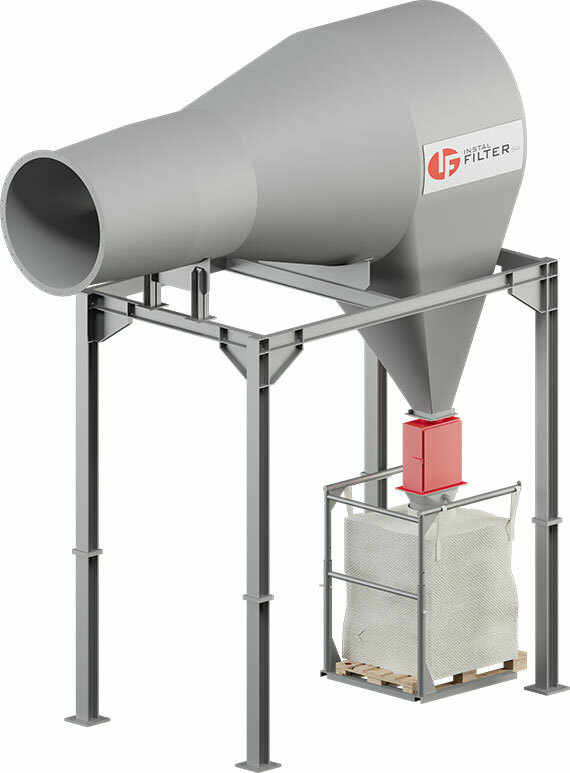 Standard series for OK dust collectors comprises erection of them from OK100 to OK1500, efficiency range from 400 to 150 000 m3/h. Sparks eliminators belong to a group of single horizontal multi-cyclones. Their main goal is extinguishing and de-dusting of glowing dust particles (sparks) existing in fumes. In the first part of dust extracting unit the dust particles get into a spiral move and they are ejected into external wall of the dust extracting unit. At the second stage the dirty gas and the pure gas are separated. Extracted dusts fall into a chute and the clean gas flows into further de-dusting process stages. Series of types we offer includes supply of sparks eliminators from IS200 to IS2500, efficiency range from 1400 to 318 000 m3/h.